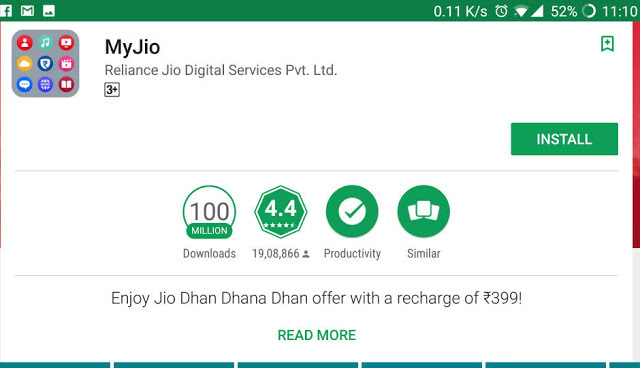 MyJio App Gets 100 Million Downloads: The Reliance Jio launched its MyJio App back in May last year before it started offering Jio Preview Offer for consumers. Earlier this week it crossed 100 million or 10 Crore installs on the Google Play Store. It crossed 50 million installs back in December last year after it hit 10 million in September last year. MyJio app is required to be installed to generate a bar code if you want to get a new Jio SIM. This might be one of the main reasons for MyJio app to hit 100 million downloads quickly. This is said to be the second most downloaded Indian application on Android after Hotstar that hit 100 million downloads on Google Play Store and first self-care mobile application from an operator to hit the milestone. Self-care applications from Airtel, Vodafone India, and Idea Cellular have crossed 10 million downloads on Google Play Store. JioTV that offers live streaming of TV channels hit 50 million downloads on the Google Play Store back in February this year and Jio4GVoice that is required for making calls on NON-VoLTE phones hit 50 million in March. Other Jio apps such as Jio Music, Jio Movies, Jio Mags and others have 10 million downloads each.